Anyone with little children knows the hassle of trying to keep kids out of the cupboards! Our little ones have all gone through stages where they just want to be near us – and that means underfoot, even when we’re in the kitchen preparing supper. As kids get more mobile, they start pulling open cabinets and exploring. Some of our cabinets don’t hold anything dangerous, but it’s still a hassle to reload all of the plastic container lids back into the drawer every time we prep a meal! We need some cabinet locks to keep children safe and out of the cupdboards. So, we headed to the internet in search of the best childproof cabinet locks that will be safe and still efficient for us to access the cupboard contents when we need to. After much searching for best child safety locks we came across, we decided on these ones, and here’s why. The new hot-ticket in the world of best child proof cabinet locks is definitely the ‘hidden’ magnet activated locks. The downside to those is that the magnet ‘key’ is a floating/free piece that needs to be stored somewhere. Sure, the kits come with a little sticky magnet holder that can be moutned to the side of your fridge or somewhere else out of the reach of children, but it still has the potential to get lost or misplaced. Any magnet will work, but as a parent with 4 young children, anything that isn’t bolted down can get carried off! Instead, here is an old-fashioned screw on option, with a twist. What makes these best baby cabinet locks better than average, is that they have an anti-pinch feature. Typically, a child can open a cabinet door with a safety lock about 2 to 3 inches until the lock ‘catches’. That’s the point where an adult (or a really crafty baby) can push the catch and allow the door to open fully. Or, alternatively, the child can put there fingers around the door, and then shut it – pinching their fingers. These Safe-lok child cabinet locks have a special feature where after the door has been opened that first 2-3 inches, the door can’t be opened or closed again without pushing down on the release tab. We used these with our first child and loved them, but we opted not to use them this time because they require screwing into our cabinets – and we just got new cabinets! Ella’s Homes claims this is the #1 magnetic cabinet lock. In fact, it looks very similar to many others on the market, with a few slight differences. These child cabinet locks come with a special mounting bracket – you can use it to clip the piece into so that when installing, the sticky pad sticks your lock mechanism in precisely the right location. 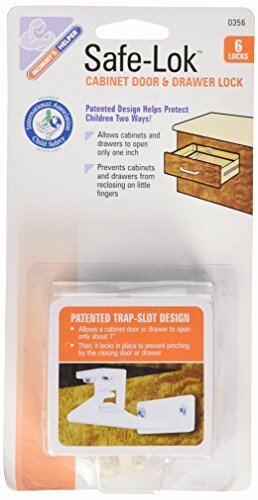 I didn’t come across any other safety locks with this sort of ease of installation – all of the other ones use some sort of cardboard template system where you mark on the cabinet where you want to stick the pieces. This system is a breeze, and I was willing to pay slightly more per lock because of it. Another feature (which, admittedly, is quite common nowadays) that makes these the best cabinet locks is that they are mounted quickly and easily with 3M stickpads. There was some concern that the pads wouldn’t be sufficiently sticky to keep a baby from pulling the door open and ripping/unsticking the pad from the inside of the door, but after seeing how sticky they are, that’s no longer a concern! The first set of baby cabiney locks we used with our first baby required us to drill tiny screws into the cabinet doors. Now that we have new cabinets, I didn’t want to do that again, so the sticky pads are an excellent alternative. Also, after reading through many reviews, and a few concerns or confusion from purchasers, there is no doubt that Ella’s Homes responds promptly to any concerns, and is willing to set things right. They definitely understand the value of having a pleased customer and a positive review! If looking for the best child cabinet locks purely based on price, there are other options out there. The cost is about the same, but per lock, the pack comes with more so the child safety locks are invididually cheaper. However, those didn’t come with the mounting bracket. So What’s the Best Baby Cabinet Locks? We actually purchased and used both of these in our house. We used the Safe-Lok screw on type baby cabinet locks for kitchen cabinets in our first house, and we liked them. We especially liked that they have the anti-pinch function where once a baby pulls the door open, it locks in the slightly-open position so that they can’t close it on their fingers again. What we didn’t like about these was the difficulty in installing them onto the kitchen cabinet doors. They also have a disable function where the longer lock arm can be slid out when it isn’t needed anymore. However, then the pieces get thrown in a junk drawer or under the kitchen sink and when you need them you can’t find them again. In our second house, when it came time to find the best child locks for kitchen cabinets, the magnetic child locks had mostly taken over the market, so we decided to give them a try. Installation was definitely simpler in the magnetic cabinet locks than the screw-on cabinet safety locks, as the magnetic kind just stick on (as long as you buy the type that come with the installation/alignment piece). There is the ‘unlock’ magnet that can get misplaced, but we had enough kitchen cabinets that needed baby proofing that we bought 2 packs, so we had 2 of the unlock magnet keys – we stuck one on the fridge, and the other lived on the side of our metal dish rack. Overall, if we were to give a magnetic cabinet locks review, we would only have one complaint – these locks are completely hidden, and that means anyone that doesn’t know you have them will think that your cabinets are stuck or broken, and will yank on the door until it opens. That means visitors, cleaning ladies, and anybody that purchases your house (if you forget to tell them about it – oops) will likely just tear the cabinets open and ruin the sticky pads.